New Directions Publishing Corporation, 9780811225205, 128pp. The Attraction of Things concerns the entirety of beauty and the possibility of grace, relayed via obsessions with rare early gramophone records, the theater, translation, dying parents: all these elements are relayed in a dizzying strange traffic of cultural artifacts, friendships, losses, discoveries, and love. Roger Lewinter believes that in the realm of art, "the distinction between life and death loses its relevance, the one taking place in the other." 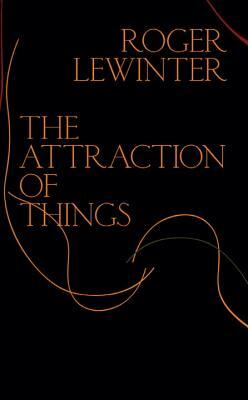 "The Attraction of Things," states Lewinter, "is the story of a being who lets himself go toward what attracts him, toward what he attracts--beings, works, things--and who, through successive encounters, finds the way out of the labyrinth, to the heart, where the bolt of illumination strikes. This is the story of a letting go toward the illumination."